After months of hard work and fine tuning of details, I'm pleased to present you with the newest piece in my collection of fantasy accessories: Elder Goddess Tentacle Horns! 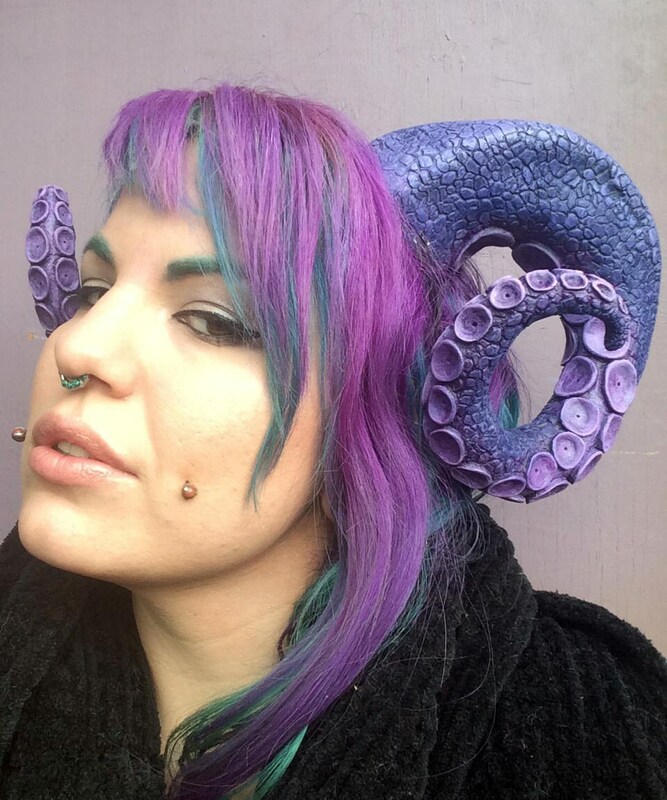 Whether you're a siren, sea witch, ocean goddess, Deep One, or simply a cephalopod enthusiast, these fantastic one-of-a-kind horns are the perfect costume center piece. 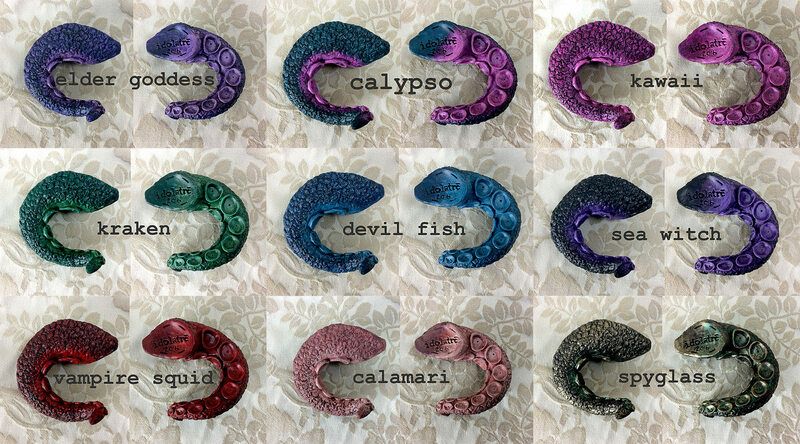 These original pieces are truly exquisite and unique, with a gorgeous spiraling ram horn shape, painstakingly textured skin, and individually sculpted suction cups that curl around the length of the tentacles. The horns are cast from the lovingly hand sculpted Idolatre originals, composed of hollow plastic resin, and weigh a mere 17 oz. per pair. Why are your processing times 2 weeks even for unfinished component pieces? What goes into producing your cast pieces besides just casting the item? Post casting there are a variety of tasks performed to ensure you get high quality pieces of art. First, all pour spouts and vents are delicately cut off the pieces. Then seams sanded, & small details replaced that may have been lost during the previous processes. Each piece is inspected for imperfections, and corrected with a dremel. If the pieces are to be mounted on a headband, oblong holes are removed from the base, & the openings are sanded to reduce elastic friction. If the pieces are scheduled to be painted, they would then be primed with a spray primer for best paint adhesion, then coated with acrylic spray paint for their base coat. After 3-6 hours cure time for both spray steps, they are ready for hand painting & mounting. Whew! I am an international customer and I do not wish to pay customs. Will you lie for me on the shipping receipts and say my purchase was really a gift so I don't have to pay ____ country's duties and tariffs? I print all my shipping from Etsy directly, so this is not an option. I also will not undervalue a package being shipped internationally as I include insurance for the full value of the package contents. Even when marked as a gift, tariffs can still be charged when it is opened and inspected by a customs officer at the border if it looks suspiciously like a purchase, which purchases usually do. I can be held responsible legally and FINED for lying on customs forms. The fines for these violations are huge, and I will not take that risk. Additionally, please note that I will not give refunds for items returned to me due to non-payment of import dues. Concerned? Check: simplyduty.com/import-calculator to calculate costs incurred by your gov. Do you offer wholesale discounts on your unfinished resin products? I'm sorry, but I do not wholesale my resin components. I sell individual unfinished resin pieces as an egalitarian gesture to individuals who would not otherwise be able to afford a headdress so that they can still purchase something in their price range and create their own magic. Art is my full time job so I know all about wanting wonderful things that cost more than I can afford! It should go without saying, but: ITEMS PURCHASED MAY NOT BE REPLICATED WITHOUT SPECIFIC WRITTEN PERMISSION. NO EXCEPTIONS. 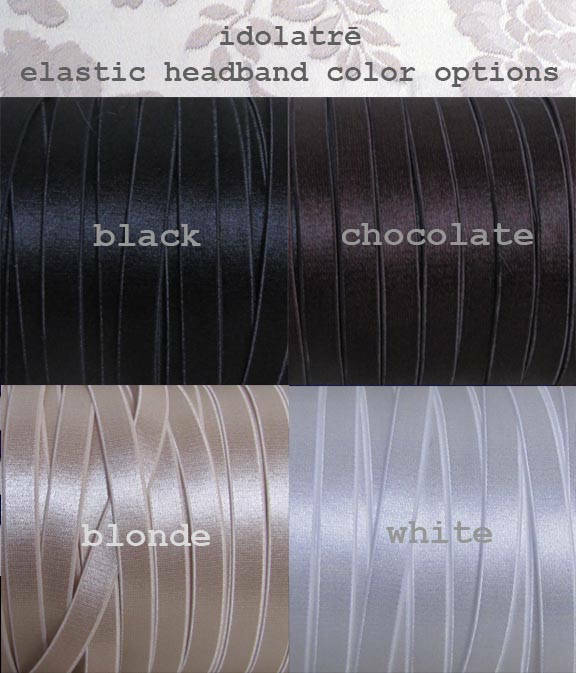 That said, I do offer wholesale discounts on completed headdresses purchased in quantity, so if you're doing a group cosplay, stocking your boutique, or outfitting your theater or dance troupe do not hesitate to ask! I want to purchase your ___ and use it in a photo shoot- is that alright? Absolutely! I'm flattered you would want to use my art in the creation of your own. In fact, feel free to use the coupon code PHOTOSHOOT10 at checkout for 10% off your purchase. I really like your stuff and I want to make something exactly like it- where do you buy your ____? Part of the hard work that goes into making visually compelling products is sourcing wonderful materials. This takes a lot of time and effort, and helps my items look unique. If I gave away the sources that I have worked hard to acquire, it would compromise the individualism of my shop. This is actually part of the reason I've evolved my store to make almost all my own components & findings- because if they are purchased from a vendor, people will find that vendor, then all of a sudden 40 copy shops pop up on Etsy attempting to make something suspiciously resembling your products. Needless to say, that it's more than disheartening when you work so hard to develop your own unique designs. So sorry, but I'm not sharing sources. Are these horns/antlers "real"? Do you use "real" fur? Nope! The horns and antlers are composed of Smooth Cast 300, a polyurethane resin. Not only that, but they're not cast from real horns or antlers, either. Which means that not only are they more balanced and far lighter weight for a human head/neck than their natural counterparts, they're also symmetrical little works of art for your head that are completely vegan from start to finish. Likewise with the fur- it's all high quality acrylic and animal free. Is this price in any way negotiable? Sorry, all my prices reflect the time it takes for me to make the items and the cost of materials. This is more than an expensive hobby for me, this is how I make a living. Can I have progress shots of my order? I'm afraid this is not a service I offer as the time to stage and take the shots is not included in the cost of the item. Seller was amazing to work with. Super fast shipping. Horns were absolutely amazing!!! Thank you! Absolutely stunning! Worth every penny and then some. Stefanie is a delight to work with. 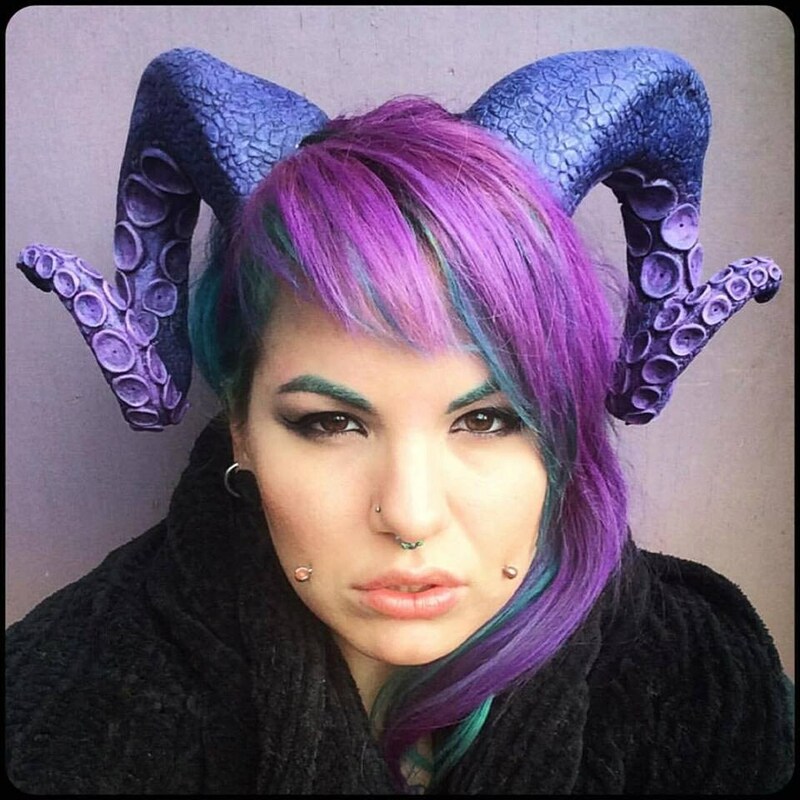 I contacted her after receiving the horns to see about a custom headpiece to enhance the look. Can't wait until it all comes together in a few weeks! I love them soooo much!! Thank you!! Absolutely lovely, these are beyond expectation! Grand seller too, very personable and friendly.